Certain aspects of life are requirements and are preset , and within reason repetitive. While you may have three of four meals a day, they dont have to be the same all the time. Churches for years have got away with murder literally by making huge parts of their function Preset. Liturgy. Rotational readings. The function of Mass or Communion. Or the Lord's prayer. Celebrate the Lord's victory in the breaking of Bread until His return. Preset and custom is computer speak. John 4 makes it clear PLACE is now irrelevant. And worship is now in Spirit and Truth. LIVING AND BEING IN THE NAME OF JESUS. 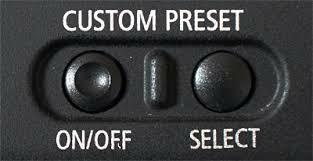 So how can we differentiate PRESET from CUSTOM? Well the Sabbath is for MAN and not MAN for the SABBATH. This is one crazy revelation the more you unpack it. The PRESETS are there like scaffolding until the CUSTOM is fully manageable and functional. Many of the attendant PRESETS came with outer vestments, outer imitations of holiness, of worship, but now the real thing is here, all the outerforms will just crumble in ridiculousness. We could see the writing on the wall when a Man just walks out of a tomb after three days, walks through walls, cooks a barbecue on a beach, then lifts to heaven in front of us 40 days later. This is just beyond all bounds of religion. This is heavenly Life. This is the sure ANCHOR Hebrews talks about. I mean not to threaten you unduly but I need to warn you all about this grace stuff. I am not saying something that may be true. I am not saying something that has not already happened. something will happen....like a tide coming in, then go out for a bit, then re establish itself more thoroughly. Abraham Isaac and Jacob were all like the Kingdom coming into land. Then this got reproduced in a people. What am I getting to? Well, the disciples for a start. right down through the revival since Luther to the present day. Pentecost crashed in on the world again in the 1900s. No more of this stupid tithe idea where one leader gets to swan around his flock at the top of a pyramid. I just wanted to give you early warning so you may want to start making prayerful plans, lest all of a sudden you are relying on old outdated supplylines, yet havent sufficient clue about the NEW to be of any use to anybody. This is kind of like Jesus saying, hey when you go to somewhere new remain at the back, dont go to the top table. Wait util they recognise you and call you up. Some of you want to prepare for such a scenario, before you look absolute idiots as you are called down from the top tables. You may cope with it, but I can tell you, many of the rest of your family won't. Some of their own personal self image rightly or wrongly is invested basking in your glory....so if your glory is nolonger real, you want to watch out.